There are four different award types available for EBSQ exhibits. These award types are based on whom is doing the voting: Artist-Members, Registered Visitors, Jurors, or anyone ('The Cloud'). Not all shows are juried and therefore don't have a Juror award type. 'Choice' awards are synonymous with 'first prize' and are awarded to the entry(ies) with the most votes. 'Mention' awards are synonymous with 'second prize' and are awarded to the entry(ies) with the second most votes. Member Awards are given to entries based on votes received from EBSQ Member Artists (paying members). Patron awards are given to entries based on votes received from EBSQ Patrons (non-paying members). 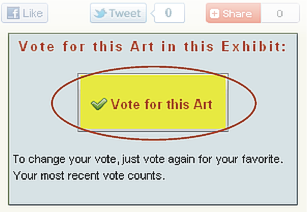 Member and Patron voting is done using a vote button that appears while voting is available. Depending on the membership level of the voter (Member or Patron), the appropriate vote is registered. To change a vote, the voter would simply use the same button for a different entry (which would override their previous vote). Votes are registered on a per show basis - so, voting in multiple shows does not affect a vote for another show. Anyone can vote in this manner (even those that vote as a member or patron). No tangible awards are given at this award level. Some exhibits are juried. For these, Juror awards are given to entries based on a juror's discretion. It is up to the juror to decide how many awards to give. Jurors do not use the website to register their vote, they simply email their EBSQ contact with their choices. Ties are always possible. The only exception is when a show sponsor offers a prize that cannot be shared. In this case, the show sponsor will break the tie. Only 'Member' and 'Juror' type awards are eligible for tangible awards. This is because they are the only award types that cannot be gamed. Some exhibits have sponsors that may be offering an award directly to the Member's or Juror's Choice winner. If you're interested in contributing a prize or otherwise sponsoring a show, contact our Exhibitions Coordinator, Melissa Morton.